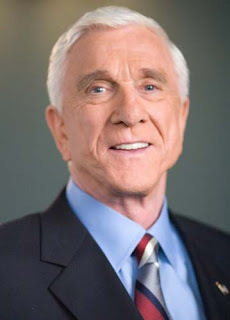 It makes me sad to announce that the great comedian Leslie Nielsen has died today. According to CJOB.com, Mr. Nielsen passed away earlier today from complications relating to pneumonia in Ft. Lauderdale, Florida. Even at the age 84, this is a still sad passing. Nielsen's NAKED GUN movies were some of the first I started watching when I was young thanks to my Abuelito (Grandpa for you non-Spanish speaking folks). As a quick note for those that don't know, I was born in Mexico, and my Abuelito was instrumental in showing me movies from all genres. For the longest time, I watched the Spanish dubbed movies, and I remember Mr. Nielsen's faces making the biggest impression on me. The funny faces are what I always remembered. It wasn't until I could speak English so many years ago, that I rewatched a lot of his movies and found my love for them wasn't just nostalgia, but true quality. The man was hilarious in his delivery and his timing, and that's a quality many actors don't have today. Recently, Jonesy and I watched BEN-HUR(1959) for the upcoming AFI Top 100 movie column, and when watching the movie's special features, we found out that Mr. Nielsen auditioned to play the role of the villian Messala. Turns out, he was a rather respected method actor before AIRPLANE! (1980) showed the world what a hilarious actor he was. He went on to do the famous NAKED GUN series as well as SPY HARD(1995) and DRACULA DEAD AND LOVING IT(1998). He ended up specializing in spoofs late in his career with films such as SCARY MOVIE 3 & 4 ( 2003, 2006) and 2001: SPACE TRAVESTY (2000). Excuse me while I go revisit NAKED GUN and remember the good times. And don't call me Shirley.